This page contains the Software used on the paper presented in ICB 2015 (Appearance-Based Person Re-Identification by Intra-Camera Discriminative Models and Ranking Aggregation). In this work, we used prototypes to indirectly handle with the camera transition problem. Thus, for a given gallery image, we computed the most similar individuals in training set that were captured by the same camera. For each of these individuals, we used its respective image in the opposite camera (prototypes) to learn a appearance model using Partial Least Squares (PLS) in one-against-all (OAA) scheme. 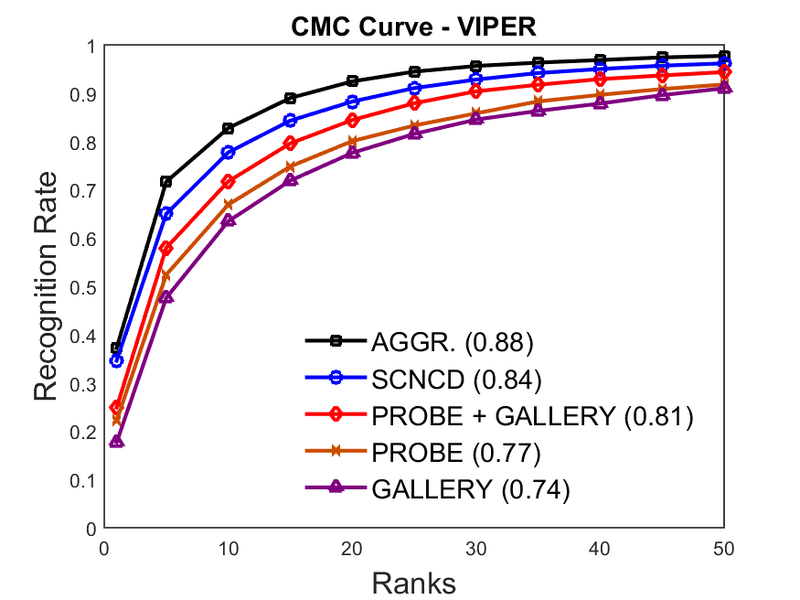 We did the same for each probe image and aggregate the obtained results using Stuart’s ranking aggregation method. The experimental results are reported using Cumulative Matching Curve (CMC) with 10 trials.